Dr. Aaron Strickland spent many years in college and completed a dental residency while preparing for his life’s work as a Dentist. He is a graduate of the Indiana School of Dentistry and he loves his chosen profession. He became a dentist in 2005, got his residency 2006 and has been practicing ever since. 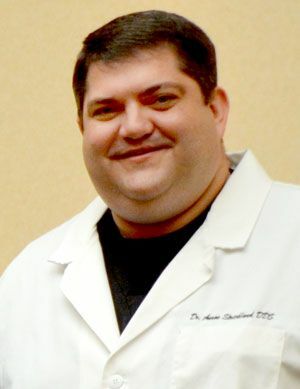 While wearing his white coat he often appears as a confident, yet soft-spoken professional who believes that the mouth is the gateway to the rest of the body. “Healthy mouth – Healthy Life” is his motto. But outside the office, he is just Aaron, a man with a bucket list who dreams of the fast life and hopes someday to ride along beside a professional race car driver at top speeds! He has already proven to live on the edge with his love of white water rafting. In his off time he also enjoys traveling, hiking and walking. He enjoys community service and is a sponsor and participant in Dentistry from the Heart, an annual free dentistry day in Columbus, Indiana that is open to everyone. Total relaxation for Dr. Strickland would entail lying on a beach in the Caribbean. If you ever bump in to him sprawled out on the sand, or anywhere for that matter, if are smiling at him and he sees you, he will probably smile right back!